Thank you so much for all of your input on my cabinet drawer and gold leafing question! I read every single one of your 225+ comments and suggestions (on yesterday’s post and on Facebook), and really gave them some thought. And then my mom and brother came over just to look at it in person with me and consider some of your suggestions that really stood out to me and see if we could narrow those down into one final plan that would work with the wall of cabinets as well as suit my own taste and vision for my kitchen. All three of us agreed immediately that leaving the gold leaf off of the peninsula and fridge/range wall completely, and having it just on the wall of cabinets, was not an option. All of the cabinets in the entire kitchen need to look consistent. We all also agreed that leaving gold leaf off of the drawers altogether and just leafing the doors wouldn’t work simply because of the asymmetry of the peninsula with nothing but drawers on the left side. And one more thing we all agreed on was that the striking thing about the Diaz kitchen that has inspired my cabinet design was the repetition of the brass rectangle detail on every single door and drawer in the kitchen. So that ruled out any kind of corner gold leaf detail, or design just under the handles on the cabinets. It’s the repetition of rectangles specifically that I like, and I needed to figure out how to do that in my kitchen without it turning out looking like some kind of craft project afterthought. Here’s what we came up with (and several of you were thinking along these same lines as well). All of the top shallow drawers on both the peninsula as well as the fridge/range wall will be left as is. They’ll just be painted and have (awesome and stunningly gorgeous!!) hardware added, but no gold leafing. But I’ll completely remake the four big drawers. That will add balance to the whole thing, as well as give some “relief” from the gold leaf design on the top row of drawers. 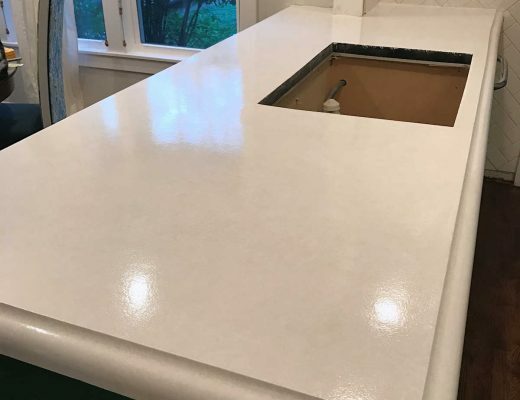 So everything under the line on both sides of the kitchen will have the same look, and everything above the line will look uniform all the way around. Next Post FAQ: "How Does Matt Handle Your DIY Projects?" I would never in a million years have thought of that solution.Congrats on solving your puzzle, AND on some very creative thinking. I know it’ll be gorgeous when you finish. You may have posted this answer somewhere else, but what color hardware are you using? A weathered gold tone might be a nice compliment, especially for tying in the small drawers. Perfect solution…and I love all of the colors in your example kitchen. Great idea! I knew you’d come up with the best solution for your space. 🙂 Can’t wait to see it! It’s going to look beautiful. I’m so proud of you that you’d think it were my kitchen!!! Once again you have proven your professional expertise in design. Great solution, Kristi, I think it will look just right. Oh my gosh Kristie, that is an incredible solution. I love the look of the larger drawers and it is gonna look amazing! I really like the “relief” on the smaller drawers as you said too. I can’t wait!!! What a great idea!!! 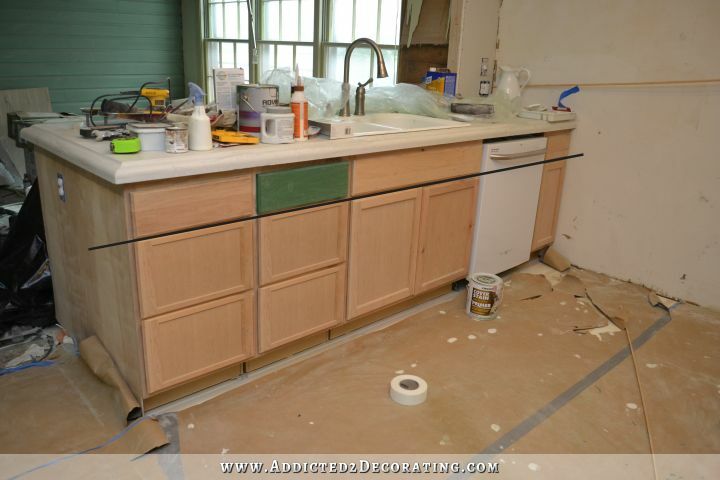 Cant wait to see the finished drawers! I really, really like this idea!! It brings a real sense of balance to the peninsula! Phoebe, I don’t think she’s found the handles she wants yet. But they will be gold or antique brass. But won’t the handles change everything??? You are such a prolific blogger that I am usually a day (or two or three) late and a dollar short when I post any comments. But this time I got the timing right. What you propose is an ambitious but really good solution to the dilemma and it will certainly pay off in the end. This project has been so great to follow! Phoebe, nothing will stick out. She’s recessing the panel on the drawers. Check out the photo, and you’ll see that’s how they’ll look. I think that you came up with the perfect solution and were wise to have brother & Mom over to work through with additional sets of eyes! I like that it will be balanced which provides a symmetry in and of itself! That’s a big deal! BINGO.. Perfect, beautiful kitchen. I love watching your progress. You amaze me. Just amazing but then I am not surprised. You have given tat bank of cabinets the lift from stock to custom without the price. I love it. Yup, you hit the nail on the head, that is a great solution! 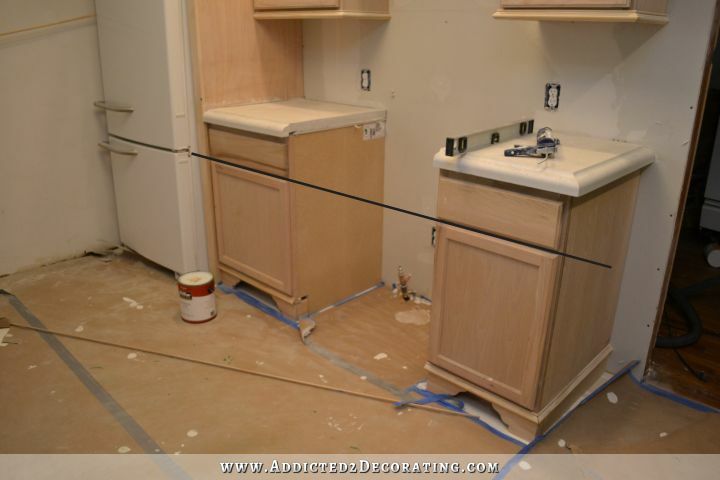 I can’t wait to see the finished cabinets! Should come together beautifully with everything complementing rather than competing for attention. It will be a showstopper. You always manage to come up with the most perfect solution, Kristie! You are so smart and creative! I think that will be the perfect solution! Woot! Woot! Perfect solution naturally. Honey I find it hard to believe that anything you do, make, compose, etc. etc. etc. would be considered a hack. I love the idea of recessing the drawers. My only thought is can you leave the trim off of the bottom of the top drawer and the top of the bottom drawer so that the trim is symmetrical to the doors and then gold leaf? Whatever you do will be perfect! As someone has already said, you really did hit the nail on the head. Congratulations. And I really like the fact that the top drawers will be different. 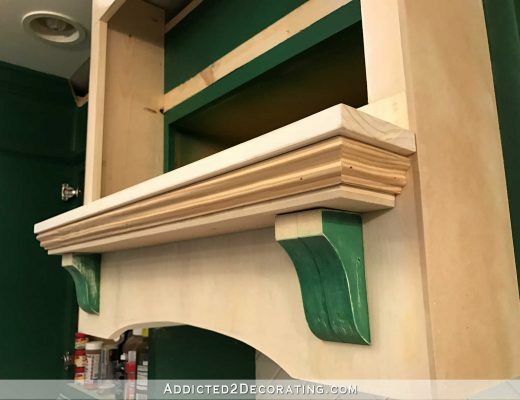 This idea is perfect for making the spindles/legs on the wall of cabinets (which you did not gold leaf) tie into the whole look of the kitchen cabinets. 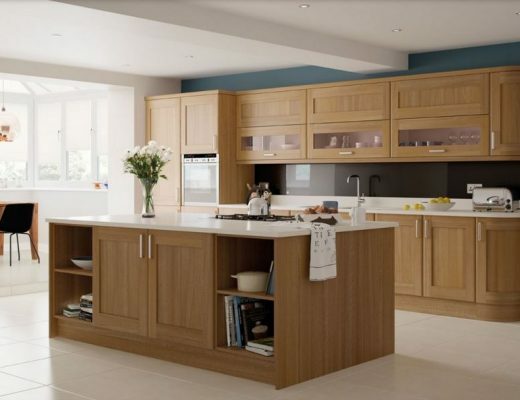 My kitchen cabinets are white and the door fronts are make just like yours and the drawers are plain. Many were commenting on whether you were going to add some gold leaf to the legs, but this will make the legs and the small drawers tie together as a whole. Looking forward to your next post! Great idea! It’s going to look beautiful! Never mind. Went back and read it again. You are using corner round. Terrific solution! It will look balanced, intentional, and beautiful. WOW!! I LIKE this solution. I also read quite a few (35? – it was as many comments as existed when I read the post) comments to see if anyone had a solution for you, and no one had come up with this solution in those comments. AAMOF, many people suggested the router option, which I wasn’t fond of, the one I thought was the BEST solution was the adding the extra trim to the perimeter of the drawers, but I thought it might look a little odd. I’m VERY curious as to how you actually DO this, so I’m hoping you’ll post the detailed pictures that you usually do! Kristi, your kitchen is going to look sensational! In my book, you are simply amazing. PERFECT!!!! ABSOLUTELY STUNNINGLY PERFECT!!!! BRAVO!!! And coming up with such an ingenious solution just proves you are the professional, Kristi! It’s going to look beautiful! That’s going to look amazing. Great idea! It’s a winner. I had total faith that you would come up with the perfect solution and you did. It will be gorgeous! Sounds like a great plan. Now, to throw out another option: since you are going to be completely rebuilding the drawer fronts, could you replace the two drawer fronts with a door, and have pull out drawers behind it? This would offer complete symmetry while keeping your drawers. Just a thought. Do not know if it is possible with the current cabinet construction. At any rate, I think it will be perfect! Perfect solution and very inspiring! I am very new at doing some DIY small projects and I am getting so much info out of your blog! Thank you!